A solar flare has sent a blast of magnetic particles hurtling toward Earth – but don’t worry, we’re not set for a mass extinction event, rather a dazzling light show above the US and Canada. Solar flares, which are mostly harmless ejections of energy from the surface of the sun, send clouds of particles made up of electrons and ions into our atmosphere. They usually reach our planet within a day or two, treating earthlings to majestic ‘auroras’, fluorescent light shows caused by collisions between sun particles and nitrogen and oxygen. Solar flares have potential to be far more damaging, however. The most powerful flare recorded to date was in 1859. Known as the ‘Carrington Event’, the solar flare knocked out telegraph systems all over Europe and North America. The resulting auroras were said to have been so bright that they could be seen as far south as Sub-Saharan Africa. If such a powerful geomagnetic storm were to strike today, it would likely knock out power grids, communications and satellite technology, potentially causing trillions of dollars worth of damage to the global economy. According to space weather experts, this latest outburst is unlikely to cause much disruption here on Earth. 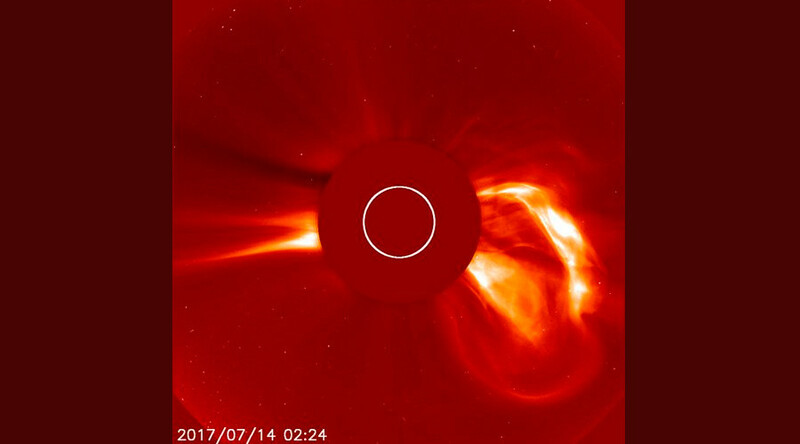 Relatively mild, this solar flare has been described as a ‘moderate’ G2 geomagnetic storm by space weather watchers at the National Oceanic and Atmospheric Administration (NOAA). People residing in latitudes 55°N – which includes North America, Great Britain, Ireland and parts of Russia – could experience some power surges. Most will likely be treated to an breathtaking display of aurora. The moment the flare left its host was captured by the Large Angle and Spectrometric Coronagraph (LASCO), an instrument part of a joint NASA-European Space Agency mission studying our sun. A coronagraph is a telescope designed to block the blinding light of the sun in order to study emissions from it. News of the solar flare come two days after NASA announced the discovery of a gigantic ‘hole’ in the sun. This massive sunspot, a mind-boggling 75,000 miles wide, is bigger than Earth. The amazing footage was captured by NASA’s Solar Dynamics Observatory between July 5-11. And while such phenomena are a common occurrence, they are less likely to happen as the sun heads towards ‘solar minimum’, a period of low solar activity throughout an 11-year cycle.